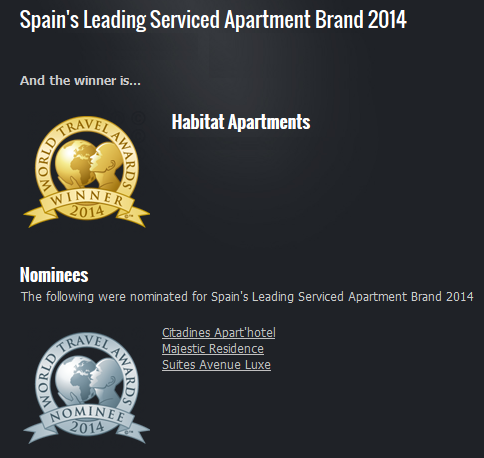 Habitat Apartments received the commendation for "Spain's Leading Serviced Apartment Brand 2014". The World Travel Award gave this prize to our company during the 21st edition in Athens, Greece. The World Travel Awards was founded in 1993 to recognize and award the excellence and quality of the global touristic sector. Nowadays, the prizes of the World Travel Award are recognized as the most prestigious in this sector worldwide. The English organisation confers their prizes regarding to a survey on profesionals all over the world. This year, 167.000 profesionals, 110.000 of whom are travel agents, participate. However, Habitat Apartments received the prize "Spain's Leading Serviced Apartment Brand 2014" in the 21th Annual World Travel Awards, so we want to say thank you. Thank you to all of you! Without you, our guests, we would never have made this!